Many readers know this, but New York state triggers recognized party status based on the performance of the gubernatorial candidate. 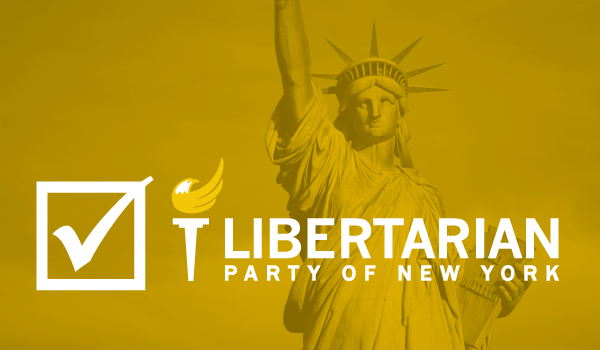 The status of the Libertarian Party in New York is currently “Independent Nominating Body”. We can achieve recognized party status for the next FOUR YEARS if our gubernatorial candidate exceeds 50,000 votes on OUR LINE in the 2018 general election. Recognized party status most helps us for petitioning to gain ballot access. Petition signature counts drop substantially with party status. In general, the larger races drop to one-third. For local and county races, signatures demands can drop by 10:1 or more. It’s unattractive for Libertarians to campaign for part time local or county government elected public official positions when it may take upwards of 100 hours of door-to-door petitioning to get the needed signatures. We can be most competitive in local races, but we don’t see many candidates run for local races due to the petitioning challenge. We have to escape from this trap. Since we need the 50,000 signatures for governor on the Libertarian line, we should press hard to run as many candidates as Libertarian, and only Libertarian, throughout the state this year. We’re near the bottom of the ballot as an independent nominating body, so a voter who searches for a friend they want to vote for on the ballot, will be more likely to vote for our gubernatorial candidate on that line also. Please think about running for public office as Libertarian and seek out others to do so. Get out a Libertarian message on a Facebook page for the campaign. Help the team for the future. A campaign can be run with little to no expenditure, even for a larger race such as New York State Assembly (1,500 signatures). Contact your local Libertarian Party affiliate to discuss the process of running for public office.